Batimastat (BB-94) is a potent, broad spectrum matrix metalloprotease (MMP) inhibitor for MMP-1, MMP-2, MMP-9, MMP-7 and MMP-3 with IC50 of 3 nM, 4 nM, 4 nM, 6 nM and 20 nM, respectively. Also inhibits the activitity of other metalloproteases, such as ADAM17. Nature, 2017, 549(7673):533-537. Batimastat (BB-94) purchased from Selleck. To assess cleavage, 2 μg of pro-TNF-α was incubated with either 2 μg ADAM17 or 2 μg MMP9 in the presence or absence of inhibitor. Lanes are as follows: 1. Molecular weight markers, 2. Pro-TNF-α alone, 3. Pro-TNF-α + ADAM17, 4. pro-TNF-α+ ADAM17 + BB-94 (10 μM), 5. Pro-TNF-α + MMP9, 6. Pro-TNF-α + MMP9 + AB0041 (10 μM), 7. Pro-TNF-α+ MMP9 + BB-94 (10 μM), 8. Soluble TNF-α. 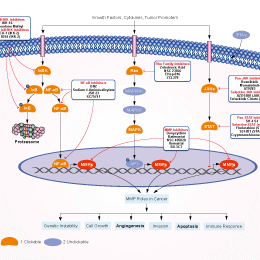 PLoS One, 2015, 10(5): e0127063. Batimastat (BB-94) purchased from Selleck. Effect of the broad spectrum hydroxamate inhibitors batimastat and ilomastat on a disintegrin and metalloproteinase with thombospondin type 1 motifs (ADAMTS) 13 and ADAMTS15. (A) While batimastat is a good inhibitor against ADAMTS15, ilomastat has no ability to inhibit the enzyme. ADAMTS15 (20 nM) was pre-incubated with two doses (300 nM or 3 µM) of batimastat and ilomastat prior to the addition of aggrecan substrate G1-IGD-G2. The inhibitory effect of batimastat can be clearly discerned from the undigested 130 kDa G1-IGD-G2 bands. (B) Calculation of the Kiapp value of batimastat by densitometric analysis of the undigested G1-IGD-G2 bands on a 12% SDS-PAGE. Biomed Rep, 2016, 4(1):73-78. . Batimastat (BB-94) purchased from Selleck. Calculation of the Kiapp value of batimastat by densitometric analysis of the undigested G1-IGD-G2 bands on a 12% SDS-PAGE. Biomed Rep, 2016, 4(1):73-78. Batimastat (BB-94) purchased from Selleck. Chirivi RG, et al. Int J Cancer, 1994, 58(3), 460-464. Botos I, et al. PNAS, 1996, 93(7), 2749-2754. Wang X, et al. Cancer Res, 1994, 54(17), 4726-4728. Taraboletti G, et al. J Natl Cancer Inst, 1995, 87(4), 293-298. Marimastat (BB-2516) is a broad spectrum matrix metalloprotease (MMP) inhibitor for MMP-9, MMP-1, MMP-2, MMP-14 and MMP-7 with IC50 of 3 nM, 5 nM, 6 nM, 9 nM and 13 nM, respectively. Phase 3. Ledipasvir (GS5885) is a HCV NS5A polymerase inhibitor, used for the treatment of hepatitis C virus infection. Nobiletin, a citrus flavonoid isolated from citrus peels like in tangerine, which has anti-inflammatory and anti-tumor activities. 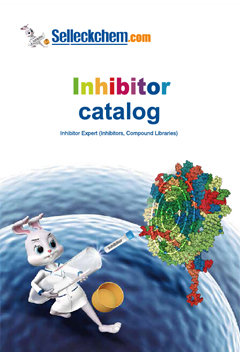 Ilomastat (GM6001, Galardin) is a broad spectrum matrix metalloprotease (MMP) inhibitor for MMP-1, MMP-2, MMP-3, MMP-7, MMP-8, MMP-9, MMP-12, MMP-14, and MMP-26 with Ki of 0.4 nM, 0.5 nM, 27 nM, 3.7 nM, 0.1 nM, 0.2 nM, 3.6 nM, 13.4 nM, 0.36 nM, respectively. NSC 405020 is a noncatalytic inhibitor of MT1-MMP, directly interacts with PEX domain of MT1-MMP, affects PEX homodimerization but not catalytic activity of MT1-MMP. SB-3CT is an effective and selective gelatinase inhibitor with Ki of 13.9 nM and 600 nM for MMP-2 and MMP-9, respectively.